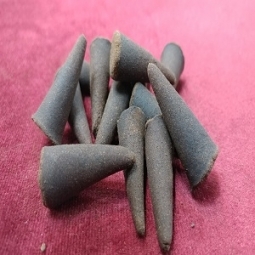 Some Information about DragonMarsh Incense Cones. With the exception one or two imported cones, we start with a cone blank, then dip them in high quality Essential & perfume oils until they are thoroughly soaked through. We slow dry the cone to insure as much of the fragrance remains within the cone. We NEVER presoak the cones in solvents or extenders as some of our so-called competition does. Most of our cones are packed 13 to a package, however some larger cones may be less. The average burn time on our cones is about 20-30 minutes.